BMW AG is lowering the estimated fuel economy labels on four 2014 Mini Cooper models after tests by the U.S. EPA, the agency said today. The EPA completed a fuel economy audit on the Mini Cooper and found actual mpg lower than the figures BMW submitted for certification, a statement said. As a result, the EPA supervised a new round of tests by BMW. The agency also conducted its own testing of the Mini Cooper at the National Vehicle and Fuel Emissions Laboratory in Ann Arbor, Mich. 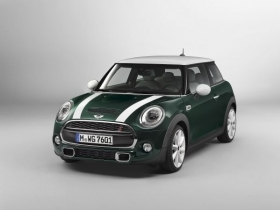 The agency is ordering BMW to relabel four 2014 Mini Cooper models -- the Mini Cooper hardtop with a manual and an automatic transmission and the Mini Cooper S hardtop with a manual and an automatic transmission -- that proved to have lower fuel economy than the mpg label showed. BMW will have all four models’ combined and city mpg ratings fall by 1 mpg, while highway estimates will drop 1 to 4 mpg depending on the model. BMW joins a list of automakers that have had inaccurate fuel economy labels. The EPA has also ordered Mercedes-Benz, Hyundai, Kia and Ford to lower fuel economy ratings after discrepancies were found in mpg values on several models. Diana T. Kurylko contributed to this report.